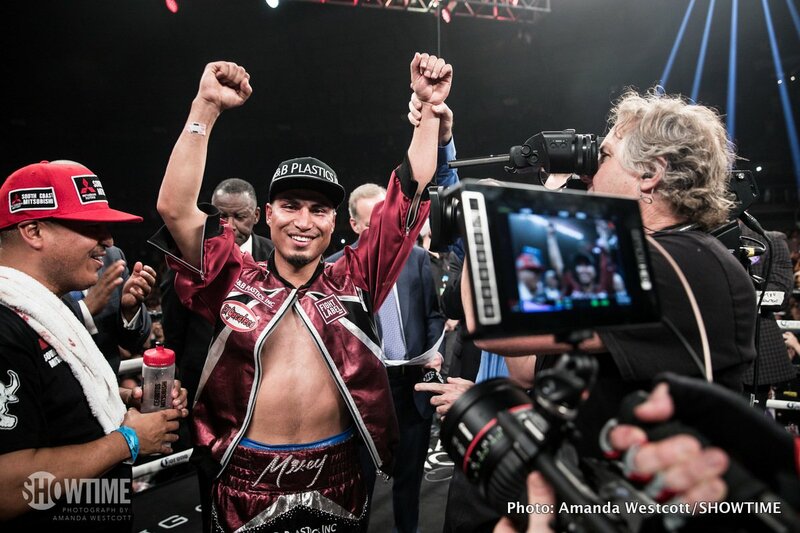 Mikey Garcia (38-0, 30 KOs) picked up his 4th division world title in defeating previously unbeaten IBF World light welterweight champion Sergey Lipinets (13-1, 10 KOs) by a 12 round unanimous decision on Saturday night at the Freeman Coliseum in San Antonio, Texas. The scores were 116-111, 117-110 and 117-110. Many of the rounds were very close. There were 6 rounds that could have gone either way. Lipinets appeared to win 3 rounds decisively. With the other 6 close rounds, you can argue that he could have won the fight with the right judges. Mikey looked like he was tiring in the later rounds of the fight. He was waiting to counter the plodding Lipinets much of the time, but he didn’t like getting nailed in return after he would throw his counter shots. Garcia knocked the 28-year-old Lipinets down in round 7. However, Lipinets came back strong and fought well in the final 5 rounds of the contest. He stunned Mikey a couple of times in the fight with some big shots. He didn’t quite have enough talent to beat Garcia. What we learned tonight is Mikey is probably not good enough to beat the better fighters at 140. Had this been Regis Prograis or Jose Carlos Ramirez, Mikey likely would have lost to both of them. Mikey isn’t strong enough or big enough to beat the better fighters in this weight class. Before tonight, Mikey had talked about wanting to move up to 147 to challenge IBF welterweight champion Errol Spence Jr. That would be a bad idea for Mikey unless he’s just looking for a payday. Spence would destroy the Mikey Garcia we saw tonight. It would be too easy. You have congratulate Mikey for having a good eye in spotting a vulnerable champion in Lipinets, buy he’s not going to beat Spence or any of the other top fighters at 147. It would be a mismatch.